I briefly mentioned The Way of St James a few months ago (some 100 days apparently), when discussing motif of the medieval door at Musée Cluny. What I didn’t go into, was that Paris is the starting point of one of the French pilgrimage routes. This is marked in the past by the church of Saint-Jacques-de-la-Boucherie and its tower, where a relic of St James was preserved. Unfortunately the church has been destroyed and all that is left today is the flamboyant Gothic tower. Sitting near Châtelet-Les Halles, the tower most recently underwent a stint of preservation and restoration works about a couple of years ago. 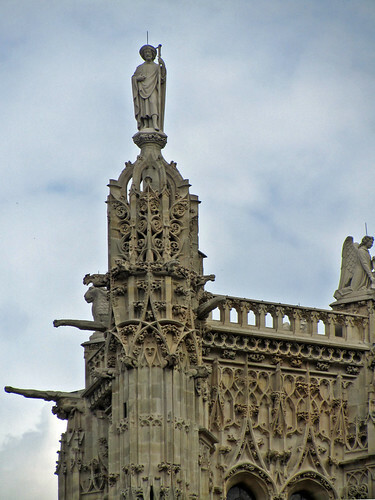 Atop, as you can see, is a statue of St James. As far as I know, the tower is not open for visitors to scale the heights for yet another Parisian vantage viewpoint. Instead there’s a meteorogical station housed in there? Just as well. There doesn’t seem to be a lot of space to accommodate many people up there at any one time – the queue would have been too insane.